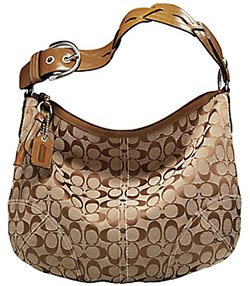 Remember the big Coach bag I'm lusting after? Well, I never got around telling you the whole story behind it. The day I walked in that Coach store, I was actually looking for a wristlet, or anything small for when I want to carry as little as possible (some cash, keys and the crackberry). That's when I saw this big beautiful bag. And I got somewhat sidetracked. But I kept telling myself that I needed a small bag, not a big one. And in the end, I was able to put the big bag down, and focus on a small one. 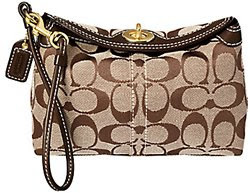 That day I did buy a Coach wristlet. This one. And I love it. The handle can stay all on one side so you can slip your hand through it and carry it as a wristlet, or you can hook the handle to the other side of the bag and wear it on your shoulder. Because I had just bought this wristlet, it made it even harder to justify buying another bag right after it. Especially when I tell you that I had bought yet another handbag just 5 days before (post coming soon). So, it shouldn't come as a surprise when I tell you that I still haven't bought the big Coach bag, even though I am still drooling over it. Where is that stimulus check when I really need it!?!? Cute wristlet! I like that it has about a 2" thickness to it - can comfortably add all you need to and still be able to close it. The flat wristlets are less practical, I think. Hey Plum, I think I've been, yes. I remember the discount back then was about $50 per bag. But this was years ago. I should go take a look. get it, it's adorable! And it comes in so many different colors. I don't really like Coach bags in general... Not the logo handbags anyway. And I would never buy it for $600.